So back to our staycation. The only problem with a staycation is that you don’t actually go anywhere (this, for some of us, is the actual benefit), so to make it seem more like a holiday I suggested that we should get up early, throw some suitcases in the boot and drive around for a few hours. We could have lunch at a service area on the M-4 then drive back home in the afternoon. For added verisimilitude, we could tack some notes up in the kitchen explaining how to use the various appliances, and leave out some brochures for local attractions, along with a visitors book we could sign. But my wife thought she’d prefer a lie-in, instead. Our week didn’t start off brilliantly. 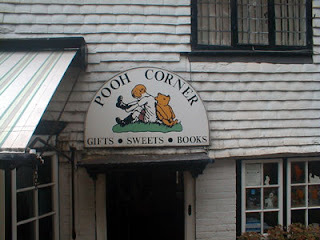 On Monday we set out for Pooh Corner and the Pooh-Sticks Bridge but, thanks to the charming tradition of not bothering to signpost the bloody roads, we instead enjoyed a lovely morning of driving randomly around Sussex. Though I have to admit, the experience of being lost, even in our own back yard, served to enhance the notion that we were actually on holiday. We did, at least, find Pooh Corner. It’s in a town. They are labeled on the map. I think it’s a law. Kew was a bit easier to find. Probably because it’s bigger. 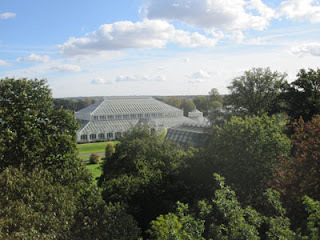 I have, for the past ten years, managed to avoid visiting Kew. We finally put that to rights. Yesterday it was Brighton, for retail therapy, sightseeing, fine dining and a show. 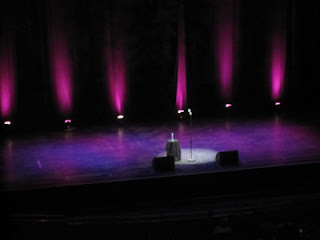 We went to see Sarah Millican, who was performing as part of the Brighton Comedy Festival. She was a scream. I wouldn't want people taking pictures of me while I'm working. 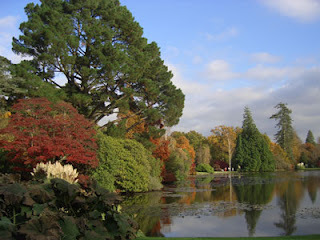 Today it’s Sheffield Park for a peek at the autumn foliage. I don’t know if we timed it right so, just in case the weather is bad or the trees don’t co-operate, here’s a photo I took when we went there in October a few years ago. On Saturday I’m dragging my wife along to the Guildford Book Festival. I enticed her with promises of shopping opportunities, dinner and a show, but what she doesn’t know is the shopping will involve mostly books, dinner will be at Krispy Kreme and the show is a talk featuring my favorite thriller writer, Meg Gardiner. But she may not have to worry about that; I have decided—as I do not like to admit defeat—to have a second go at The Pooh-Sticks Bridge after we leave Sheffield Park today. So if you never hear from me again, it’s because I am circling East Sussex, searching for road signs that don’t exist, getting more and more hopelessly lost, but not giving up. Ever. In America, I waited in line, because that is what we do. If we’re at the supermarket, in the bank or hanging around outside the ticket office for eighteen hours in order to get good seats for Wrestlemania, we are in line (and in the latter case, the people ahead of us would have been “in line” for several days). We’re taught to wait in line early: from practicing foul shots in gym class (“form a line, everybody!”) to waiting for the bus to take us home (“Line up, now, children”) we did it in a line. Some people waited “on line” but I was not one of them. Any time I found myself in a row of people and looked down at the floor, I never noticed a line drawn down there to stand on. What I did see were people, in front of me, in back of me, forming a line. And I was in it. Waiting. In line. Now that we have that straight, we can move on. The one common element about waiting in line in America is that it wasn’t something we particularly liked. A line is an inconvenience, a barrier between us and something we want, and want now. Patience, as I recall, was not a virtue. In Britain we queue, and I like that a lot better. First of all, it just sounds better; it’s a friendly, inviting word that sounds almost fun. That could be because, historically, it has been treated better: have you ever heard of people being queued up to be shot? And that’s the other thing, it’s a versatile word; you can queue up, or just queue, or be queuing (whereas you cannot, no matter how hard you try, be “lining”). Fascinating as all this is, it is largely beside the point; the point is, I found myself in a queue this past weekend. A long one. I was at the West Dean Apple Festival in need of some lunch and spied a hog roast kiosk selling roast pig on a roll. We seemed to be a good match. Unfortunately, so did 758 other people. My wife fancied a vegetarian flan for lunch; so she just walked up to the vegan booth and bought one, but I wanted pig, so I suppressed my American distaste for lines and settled into the longest queue I have seen since standing in line for the Pirates of the Caribbean ride at Disney World in 1978. I tried to be British about it, but as the day progress and I began to notice that, not only was I in a very long line, but a line that wasn’t moving very fast, my Americanishness began pushing to the fore. A customer would get up to the counter and the woman would ask for their order (NOTE: there was only ONE ITEM ON THE MENU!!). When the order was placed, she would then prepare the requisite number of rolls. Then she would carry the rolls back to the roasting pig where her partner waited. He would carve off the meat and place it on the buns (and he wasn’t in a big hurry about it, either). Then she would walk back to the counter to dispense the order. The only reason I can think of for this odd behavior is that they were the only pig roast at the festival and, therefore, had no competition. Even so, in America, that would never fly. I noticed, however, that I was the only one getting irritated—all the others were taking it in stride—so I clenched my teeth and settled in with my queue-mates to chat about the weather, and places we’d been, and how our children were doing at school, and wasn’t the coalition government an embarrassment to Britain. As I inched another step closer to the counter I began to wonder if I should get my money ready, so as not to hold things up when I finally got there. I decided, however, that rather than go through all the trouble of taking a fiver out of my wallet, I perhaps should just send away for the proper government forms to allow me to open a small business and, once the paperwork was approved, set up a cottage industry right there in the queue and earn the five pounds. God knows, I had the time. When at last I arrived at the counter and had a hot pig sandwich in my hand, I turned to the people behind me, told them I was going to miss them and asked them to be sure to write (I really did do this, but I don’t think the woman at the counter caught the irony). I then rejoined my wife, who had long since finished her vegetarian meal. She didn’t remark on my lateness; she had seen the queue and knows how I disliked waiting in line. But it wasn’t the wait that irritated me; it was the fact that it was so unnecessary. Watching inefficiencies that cost me time makes me want to find the people responsible, queue them up and have them shot. 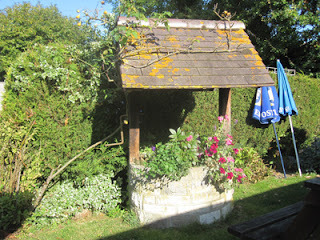 And so, belatedly, it is summer; Indian summer, perhaps. That’s what the locals are calling it, anyway, despite the improbability of it meeting all the criteria. But who would want to quibble over esoteric details on such a fine day? Certainly not I, especially when I’m on a mission. The days here are hot, the nights long and soft, leading me back to my younger days when, like today, I remained at leisure while my elders toiled these most enjoyable of days away. (Or, at the very least, I happen to not be at work on a weekday, and that’s good enough for me.) I’m heading into town today, going to a place I have never been before; a rare adventure, which makes the pull of my youth even stronger. And so as I wander, past the shops selling mobile phones, iPads and the latest in electronic wizardry, I find myself yearning, with an intensity that make me ache, for those days when a game of hide-and-seek was enough to satisfy, and the latest in high-technology was a three-speed bicycle. I wait in solitude at the edge of the market square, watching life buzz around me: Near the bandstand, a clutch of young mothers clucks and coos over the latest arrival while, at the bus stop, a doddering of matrons looks on with approval. In the shade of the chestnut tree, an elderly woman stands still as a frightened fawn, watching other pensioners parade past in jackets and jumpers. On the benches a languor of long-limbed ladies (heedless of the dangers of excessive alliteration) lounge lazily under the solstice sun, their white skin steamy in the sultry heat. Nearby, an indolence of boys—bare-chested, tattooed and rugged—gaze on in anticipation. There is nothing for me here, so I move on. I’m on a reconnaissance mission to scope out a local village in preparation for a meeting I have there next week. I find it advantageous to make a practice trip in such instances for reasons that become obvious even as the bus rumbles along the impossibly narrow country lanes: if you have never been to a place before, how do you know when you have arrived? When we enter an area where there are at least a few houses, I get off the bus. I had envisioned a twee village, perhaps with a cobbled main street lined with shops, an old stone church and the pub I was searching for. Instead, there were just empty roads, some houses and, alarmingly, no people. I walk up the road and down the road but find nothing promising. At the opposite bus stop I see a young woman and, as she is my only option, I approach her. “Do you know…” I begin. But then I realize I have nothing intelligent to ask her. “Where I am?” would make me seem hopelessly inept and, perhaps, dangerous. Asking the location of the pub would be a good opening line, but I have neglected to memorize it. 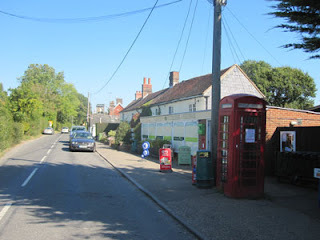 I didn’t feel the need, as I have memorized what I regard to be the one piece of information I need to know: it is the only pub in the village. But where is the village? She seems puzzled by the concept of “village,” so I take her to be a local. “Well, if you go up this road and take a left, you’ll find a pub and a store,” she tells me. I thank her and set off, but soon begin to wonder if, having noticed my accent, she has decided to play “trick the tourist.” The road I am on is narrow and empty and I am about to turn around and try the opposite direction when I round a corner and find, just as she promised, a pub, a store and little else. She smiles, relived at not having to break the news to me herself. “So I’m going to have to stay here until four o’clock?” I ask, incredulously. She shrugs and looks at the pristine sky. Post script: it is three thirty now. I have had a relaxing lunch and a fine pint. At three o’clock, the publican locked up and, without a word to me, left me here in the deserted beer garden with my pint, my cigar and my thoughts. It has been—and continues to be—a lovely day, and I can honestly say that my mission is now well and truly accomplished.